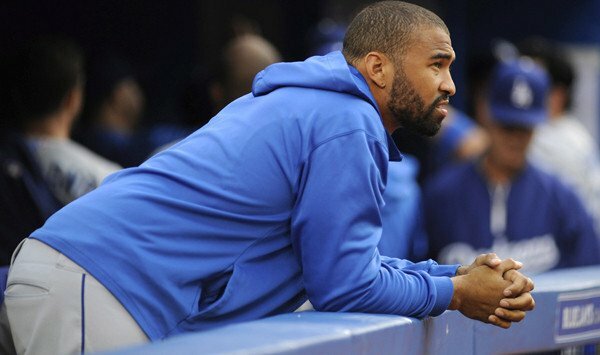 Los Angeles Dodgers Matt Kemp took batting practice before yesterday’s game against the St. Louis Cardinals and reported afterwards that things went well and he was progressing towards a return to the Dodgers line-up sooner rather than later. “[It’s] a start, it’s better than where I was,” Jim Peltz of the Los Angeles Times quotes Kemp. “Felt good to get back out there and hit a little bit. Felt like a real baseball player. He’s appeared in 62 games this season and was batting .263 with five home runs and 27 runs batted in. The Dodgers lead the National League West by five games over the Arizona Diamondbacks and start a weekend series against the Tampa Bay Rays on Friday.